Welcome to the first entry into a new feature I'm calling, Cosmic Cognizance, where I will focus on some of my favorite of Marvel's Cosmic Superheroes and Super Villains. For my first entry I decided to cover The Infinity Gems. You may ask, "But The Goog, how can gems be a character?!" Go ahead, I'll wait... "Ok!" I'd say "Let me tell you!" The gems are in fact sentient. So there. Ok, now, where to begin? Green: The Soul Gem, gives the wielder the mastery of the Soul. It is potentially the most powerful of the gems and over time actually steals the soul of the person using it. It is often referred to as vampiric. Any souls stolen by the gem are not actually consumed but end up in a pocket dimension inside the gem where the soul lives in peace, so not too bad of a trade off for having your soul ripped out of your living body. Red: The Power Gem, gives the user access to all the power and energy that has ever and will ever exist. Purple: The Space Gem, provides mastery over space. This allows the user to exist in any an all locations and to warp or rearrange space. Blue: The Mind Gem, boosts psy powers and allows access to any mind and or dream. Yellow: The Time Gem, allows control over Time itself. A user could change all time or only local time, for example ageing or de-ageing an individual. Orange: The Reality Gem, with this gem the user can fulfill any wish even if it contradicts the laws of science, in effect you can bend reality. This gem can not be used on it's own and must be used in conjunction with the other gems. Ok, when the gems first appeared in the comics, the only one we knew of was the Soul Gem which was given to Adam Warlock by The High Evolutionary. In fact once the other gems started to appear they were just called The Soul Gems. Thanos later gathered all the gems and siphoned off their power to create a weapon capable of destroying a star. He is stopped by Captain Marvel and Iron Man with the help of a now dead Adam Warlock. Adam manifests in the final moments, using the last of the stolen energy of the Soul gem to turn Thanos into stone. Eventually the Elders of the Universe gather all of the gems in an attempt to kill Galactus and gain true immortality. They are thwarted by the Silver Surfer and Death herself curses the Elders with immortality. This leaves some of them in eternal torment or robbed of the very thing that gave them their long lives and titles of Elder. A few of the lucky Elders get away and take the gems with them. Once again, Thanos is resurrected by Mistress Death as her champion and now a bit more wiser, realizes the true potential of the gems. He then sets out on a quest to once again reclaim them and by either besting or tricking the remaining Elders he manages to gather the gems once more and mounts them to his glove, he re-christens them the Infinity Gems and creates the Infinity Gauntlet. The gauntlet allows Thanos to essentially become a god (his second time holding god-hood actually). He then proceeds to erase half the population of the universe to balance life and death. He captures the living embodiments of all reality (Eternity, Infinity, Death, Galactus, the Celestials, Chaos and Order to name a few) and keeps them prisoner. Eventually he is stopped by Earth's heroes and is thought dead. As a result of this, a resurrected Adam Warlock claims the Infinity Gauntlet and is allowed audience with the Cosmic heavyweights (since he is now at or above their own level). The Living Tribunal declares that from now on the gems will never be able to be used in unison. Adam agrees and offers to form a Watch to safeguard the gems. He keeps the Soul gem but gives the others to four of his friends, leaving the keeper of the Reality gem a secret. It is eventually revealed that he has entrusted the gem to Thanos himself! Warlock knew Thanos was not dead and entrusted the gem to him also knowing that Thanos would not be stupid enough to try using the gem without the others present. Since the gems also no longer work together and no one would ever attempt to fight Thanos for it, the gem is actually as safe as it could be. 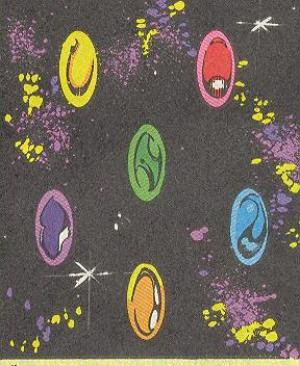 The gems are indeed kept safe for a while until the cancellation of The Infinity Watch where Marvel dumps all the gems AND Adam into the Ultraverse. I won't bother getting into that, no one ever talks about it and I think it's barely cannon. But the gems and Adam all eventually return to the Marvel Universe. Some time later Galactus decides to collect the gems himself to try to solve his never ending hunger. The gems are not able to fulfill this role and only end up releasing an evil force into the universe which Thanos has to stop (this all happening in Thanos' short lived but excellent title book). The Gems in their Gauntlet form make an appearance in the JLA/Avengers crossover where Darkseid tries to put them to use only to discover the gems do not function outside of their home universe. Recently all the gems have come into possession of the Illuminati of the Marvel U. Each member (Iron Man, Professor X, Namor, Dr. Strange, Blackbolt and Reed Richards) keep a gem in secret and have sworn not to use them. Reed had attempted to wish them out of existence but the gems are actually needed for cosmic balance, so his attempt failed. They apparently made an appearance in the limited Pet Avengers series, so I'll have to track those books down! I believe Reed now keeps the gems in a safe place, where they no doubt wait for the next cosmic crossover! I think that's about it! There's a bit more I did not mention, but I can leave the details for other posts, I think this one is long enough and this is about as detailed as I can make it with out being TOO dull. At least I hope so! Whew! I'm beat! I just finished a project that Elise and I had been talking about for some time. 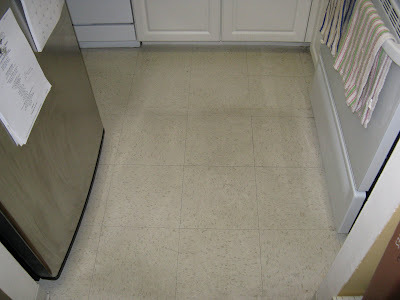 Said project being a new kitchen floor! We were in the works to have something installed by Home Depot, but that was a major headache and we eventually put it on hold because it had just become too much trouble. We had moved onto our next project of getting some ceiling fans installed. Since we have a concrete ceiling and no existing light fixtures this is not a simple task. 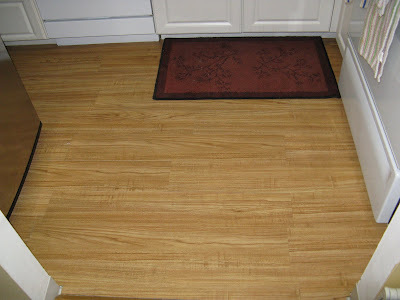 We recently found someone that lives in our building and is a contractor, so on our trip back to the Depot to buy some fans for him to install, we stumbled on to some Do-It-Yourself flooring and $80 later we walked off with the means to achieve our original project goal. Not too shabby! It makes the kitchen much more inviting and more pleasant (and hopefully less blinding when you turn the light on first thing in the morning). I think I could continue to tweak Elise's, hers is a bit more complicated than mine (which is more stylized) and I could probably simplify it a bit more, but overall I'm really happy! No, that's not a foreign greeting, it's a drink. From Goya to be exact. I have seen this malt soda in the supermarket for years but have never tried it. I have heard from a few people that had tried the drink that it was gross. I have had Goya's other sodas many times, my favorites are the pineapple and coconut sodas, and their ginger beer is surprisingly spicy! So this past week while making a quick food run I decided I was going to give it a try since all I would be out is a whole .59! I was expecting something something super sweet due to it's very dark, almost stout-like color. It turns out the soda has a nice barley flavor and is lightly carbonated. It's not overly sweet and actually quiet pleasant especially if you like barley. It reminds me of the way the house smells when brewing beer with my friend! I'm sorry it took me so long to give this Malt Soda a try, I don't think I'll drink it a lot, it's got a lot of sugar in it and hardly a health drink but it's definitely going to move into the occasional rotation along with the other Goya drinks I like and it is most certainly not gross. I was reading a Marvel Two-In-One this morning and came across this weird little ad in one of the pages, I've run into it quite a few times, but this time I thought it would be a fun experiment to try to make it my new header! I think it came out pretty well! WHAT IF Spider-Man JOINED My Blog? Hello and Happy New Year my loyal legions! Welcome to the futuristic world of 2010 AND a new comic blog! I thought I'd skip my theme of alternating Marvel and DC and go with a vaguely New Years theme. I thought Marvel's What If would be appropriate, since we do not yet know what this brand spanking new year will bring. I have always loved the What If comics. They take a familiar and popular story and give it a twist, so we get to see what might have happened if events played out differently. Sometimes it's a major change, other times it's a very small event that snowball's a character's life out of true. The series, and all What If's in Vol. 1 and 2, is hosted by Uatu, The Watcher. For Marvel's first entry into the this new format, they picked a scene from The Amazing Spider-Man #1. In the book, Peter Parker is still very new to the world of super-heroing and decides to try out for a job with the Fantastic Four. He's thinking it'll pay more than any other lame job he could find, so he sneaks into the Baxter Building in an effort to impress the FF. They are more than ready for him and quickly catch the inexperienced Spidey. Spider-Man equally quickly free's himself and bounces around Reed Richard's lab showboating and trying to convince the FF that they'll be even better with a fifth member. Once things start to calm down, Sue reveals that the Fantastic Four are a non-profit! Pete is so disappointed that he storms off. 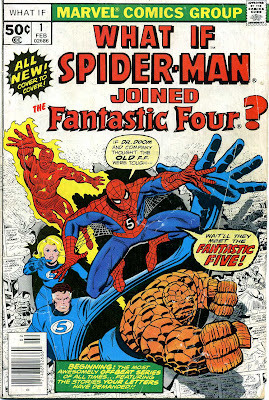 Now in the original comic, Spidey swings off into the city in a huff while the FF stand around dumbfounded. In this reality, Sue calls out to Spidey and he decides he was a bit rude after all and comes back. They then eventually decide to let Spider-Man join. This is where things start to get really kooky, when J. Jonah Jamison sees that Spider-Man is now with the Fantastic Four he totally changes his tune about the ol' Web Head and becomes his biggest fan. Spider-Man's rogue gallery starts to change, the Chameleon, who was planning on impersonating Spidey had to scrap all his plans now that he's with the FF and falls into obscurity, and the Vulture is no match for The Fantastic Five and is quickly tossed into jail. When things start to get really serious (well as serious as they can get with the Red Ghost and his super monkeys) Reed starts to ask Sue to stay behind since they have Spidey to help out. Reed is only trying to protect Sue but she is starting to get jealous of Peter. This leaves her vulnerable when the Puppet Master shows up. He has already taken control of Namor who has had a long standing crush on the Invisible Girl. Sue also has a bit of a crush on Subby and feeling rejected by Reed and the rest of the FF, runs off to meet with him. This is of course a trap and the mind-controlled Namor kidnaps Sue to the bottom of the ocean. The Puppet Master uses a hologram of Namor to taunt the rest of the FF into challenging Namor for Sue. The FF race to Namor's lair and there is a huge fight involving all sorts of weird sea creatures and a giant octopus. Eventually Namor and Sue break free of the Puppet Master's influence but when given the chance to return home, Sue actually decides to stick with Namor! She goes through some kind of experimental shell-like device called the, uh, Shell Device, and is given gills. When Namor realizes that Sue is dying by not being in the water he picks up the device and throws it through the underwater dome "saving" Sue. At this point the rest of the, once again, Fantastic Four cut their losses and escape too. Reed tries to take solace in the hope that Sue will be Namor's conscience and help to protect the surface world from Namor's (almost indiscriminate) wrath. Spider-Man laments to Johnny Storm that maybe if he had never joined the group that none of this would have happened, but Johnny just tells him to relax and "like the song says--What ever will be, will be." Whew! Did I mention this was a double issue? Well, it was! You can rarely go wrong with a What If comic and this was a whole lotta fun! I hope you guys had as much fun reading my summary as I had trying to decipher the events. Happy New Year! See you next time!